What Nutrients Are in Blueberries? Blueberries, famous in modern times for their high antioxidant content, were also prized by Native Americans, who dried them and combined them with cornmeal and honey to form a pudding. Native Americans also recognized medicinal value in blueberries and used them to treat respiratory infections. Scientific research has produced a considerable amount of information about the nutrient value and health benefits of these delicate and delicious fruits. Blueberries might promote weight loss and prevent diabetes, according to a study published in the October 2009 issue of the "International Journal of Obesity." In the study, blueberry juice in drinking water resulted in reduced food intake and slower weight gain. Blueberry juice also improved glucose tolerance and prevented the development of diabetes. Blood sugar benefits were not completely related to weight loss, say the researchers, and might also be related to activation of adiponectins -- hormones that exert a feedback control to decrease appetite. Blueberries protect against nerve degeneration, according to a study published in the September 2010 issue of the "British Journal of Nutrition." In the tissue-culture study, blueberry juice increased activity of the antioxidant enzymes catalase and superoxide dismutase, and protected nerve cells from hydrogen peroxide damage. Researchers conclude that blueberry juice might prove to be useful in the prevention and treatment of degenerative nerve disorders. 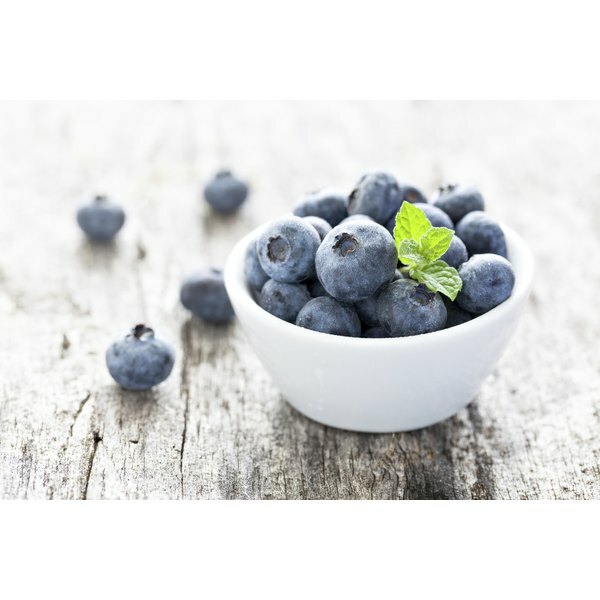 Including blueberries in your diet might improve your memory and forestall dementia, says a study published in the April 2010 issue of the "Journal of Agricultural and Food Chemistry." Polyphenol antioxidant compounds in blueberries, known as anthocyanins, have been shown to increase nerve signals in brain areas associated with memory. Blueberries also improve the brain's use of glucose in ways that might prevent nerve degeneration in the brain. In the study, daily consumption of wild blueberry juice for 12 weeks resulted in improved learning and word-list recall. Decreased symptoms of depression were also noted. Blueberries led the field in the ability to inhibit leukemia cells in a comparison study of 30 different types of agricultural plants published in the February 2011 issue of the "Journal of Natural Medicine." In the tissue culture study, scientists used four lines of human lymphoblastic leukemia and found blueberry provided the highest levels of inhibition on all four cell lines, followed by bitter melon seeds, which were effective against three cell lines. Sweet potatoes, taro and mume also showed higher levels of inhibition than genistein, an isoflavone antioxidant derived from soy and certain other plants, used as the reference substance in the study.